Need parts? We have parts for Van Dorn, Cincinnati, Toshiba, Nissei, JSW, Arburg, Sumitomo, Engel, Krauss Maffei, Niigata, Negri Bossi, Husky, UBE, Battenfeld, Mitsubishi, Brown, NRM, Wellex, Davis Standard, Hartig, Ferrel, Akron, HPM, Sterling, Egan, Killion, Berlyn, Prodex, Conair, Versa, Prodex, Ogden, Conair-Gatto, Witte, Nordson, and More. We of course also sell complete machines including all those names above as well as brand new Borche Injection molders. If we don’t have it, we’ll do our best to find it for you! Although we specialize in plastics machinery, we also sell Manual and CNC Metal working machinery. Fadal, Haas, Okuma, Olympia, and Makino, to name a few. As well as Bridgeport, Alliant, Abene, Enco, Boyer Schultz, Harig, Reid, Clausing, Parker Majestic, Chevalier, Acer Supra, Okamoto, LeBlond Regal,Springfield, HES, and many more!!! We also buy used equipment, single pieces to whole plants. We look forward to taking care of all your equipment needs! Molding Manufacturers Heads Up – Spring has Sprung ! 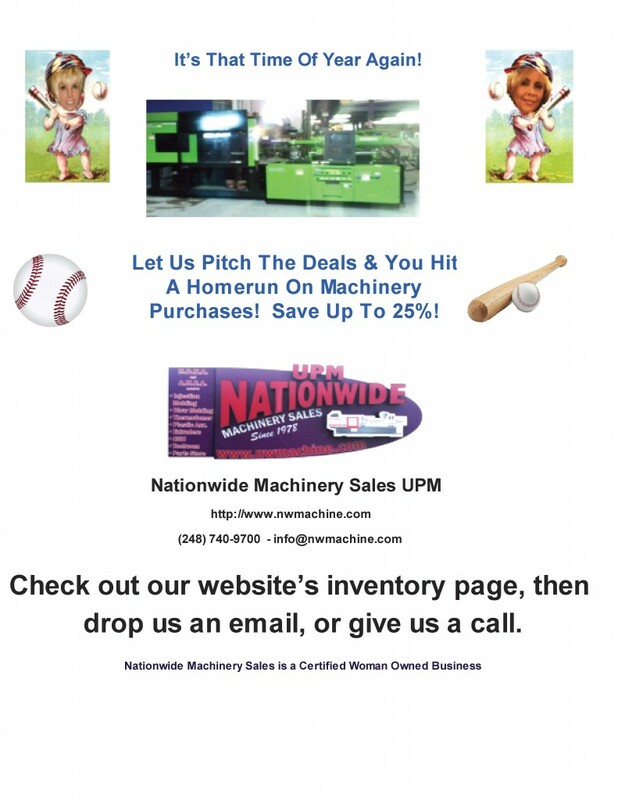 Nationwide UPM, Serving The Molding and Manufacturing Industries Since 1978.